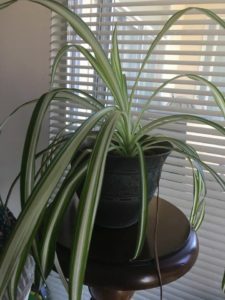 I learned something interesting last weekend about my spider plants. You see, I have two of them. One was at my home in a nice cozy spot on its own pedestal (like literally, I’m not treating it like some sort of plant god or anything!) The other was usually outside of my home and was often (and I mean OFTEN) moved around, bumped, placed in a bag for transport…it traveled! Guess which one was growing like crazy pants? You might have guessed the one that was comfortable and secure at home and I would have too, except that wasn’t the case. In fact my little traveler has doubled in size in the last few months and looks absolutely fantastic. My at-home plant hasn’t had nearly as much growth and was actually looking a bit tired. This was quite the opposite of what I expected. I figured something MUST be wrong with my at-home plant right? Mold, bugs, bad soil, too much water, not enough water, more sun, less sun…I had no idea! I had been doing SO well where it was for a while. So, I popped into my local amazing garden center and asked them. You know what I learned? Spider plants (and many others) basically get bored, lackadaisical and get lazy and stagnant when nothing changes for them in a long while. The traveler experienced a little bit of stress quite often and this caused it to soak up extra nutrients from the soil, dig it’s roots deep and grow strong quickly. The at-home plant, not so much. The advice I got? Give the pot a little shake now and again, run my hands lightly through the leaves and let the breeze blow on it through the window. For real. And it’s already working. The leaves perked right up by the next day. While he’s (she’s?) not quite back to healthy, I can see that he is much happier already. Look at me perking right up! our boring routines and we too can grow. Stress is not our enemy. Chronic heavy stress with no remedy is not good for us of course, but a little discomfort here and there? No, that my dear one is a GOOD thing. That kind of stress wakes us up, opens our eyes and soul! That is a key to our happiness. We need it to grow and thrive just like my spider plants do. We too find the opportunity to dig down deep when we are faced with a challenge or new situation. We need it to MOVE ourselves out of the rut we often don’t even notice we are in until ‘something’ happens. The nice thing is we can do this little shake up for ourselves. You don’t need to wait until that random ‘something’ happens. Make it habit to challenge yourself or try new things. Even little changes in our daily life can make an impact. Simple things like a new route to work or a new place to eat. Taking the train instead of driving to the beach. Or try a class to feel out a new hobby. The possibilities are literally ENDLESS. The best part? These little things build up your courage, wisdom and resilience so when life (and it will) throws a big curve ball your way you will be far more equipped to handle it with grace and ease. So, go little spider plant! And go you! You get out there and grow too! P.S. Have you joined the Facebook Community yet? If not, click here!